Scottish post-punk/ethereal/dream pop band formed in 1981 in Grangemouth, Falkirk and disbanded in 1997. What gets my goat is people interpreting Cocteau twins lyrics into English. Why ruin it? Some of them are atrocious!!! They're not supposed to be interpreted!!! Liz Fraser gets a lot of credit, but what really makes the Cocteau Twins sound is that dreamy guitar of Robin Guthrie. I never really thought about it until I saw this listing - they really didn't put out that many albums - most were EP's. I have been a fan of the Cocteaus since first hearing their ethereal otherworldly music in the early 80's and their music has lived with me ever since. 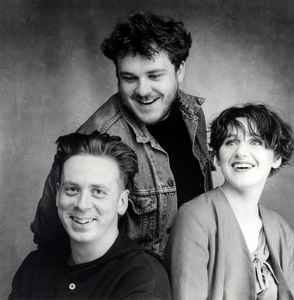 No other band has come close to being a true original in the way the Cocteau Twins did, with a sound and style that came from nowhere and was unique to them. Sadly no longer with us but the music will live on and hopefully future generations will discover and fall in love with them and come to recognise that Elizabeth Fraser was possibly the greatest voice ever committed to vinyl. Only 3 pieces of music have ever made me stop dead. The first was Teenage Kicks by the Undertones, the third was Song To The Siren by This Mortal Coil, and by far the most significant was the first time I ever heard Cocteau Twins. I was listening to John Peel late at night when he played Wax And Wane for the first time, and it was like an electric shock, just absolutely blew me away. I went out next day to buy it, only to discover that no-one stocked it (the peril of living in the rural Shropshire). In fact only one of the shops even had an account with the 4AD distributor so I ordered it, collected it two days later then and spent months playing it to death. And 33 years later the band are still my constant companion and something I never tire of listening to. I always want to write a review of this band. But how can i write it objectively enough since Cocteau Twins has already become part of me? However difficult to comment on this band, it could be said without hesitation that they are legendary, not only in the sense of their huge influence, but also because their productions have succeeded in excelling the ebb and flow of time. Their unique musical physiognomy is metaphysical. I heartily endorse record buying whilst inebriated. I was in town after a few hours at a pub when I should have been in uni lectures when I spied the sleeves to Head Over Heels and Treasure in a record shop. I bought both, not having a clue what either sounded like. The next day I went back to the same record shop and bought Garlands, Victorialand & Sunburst And Snowblind, traded in all my old Thrash metal LPs and bought anything with a 4AD catalogue number on it. & then there were the Cocteau Twins. A wash of words come up when trying to think of how to describe what sort of influence the Cocteau's have had and have left upon the better part of a generation with their strangely beautiful, amorphous, luscious and serenly textural output all matched with a visual freshness and language that impacted the graphic world at large; courtesy v23 or 23 envelope, depending. The image fit the music and the two gelled in ways which few have before or since. Elizabeth's voice and her usage of cooing and dada-ist babble, tangled in with snippets and chorused phrasing will go down as one of the more unique and beautiful voices of the late 20th century. A development which brought her closer and closer to being understood as a human and which displayed her growth both as a songwriter and personally with the later albums. Robin Guthries impact with the Cocteau Twins as a producer and follower of a sound upon sound and heavily effected and textural approach with production is broad to say the least. An approach later swiped wholesale with the brunt of the shoegazer scene and most in particular by Slowdive and My Bloody Valentine. Coming full circle to now; producers like Ulrich Schnauss and others have taken and at least technologically updated the blueprint left out by a coupla guitarists with mountains of effects, a singer who wails on herself while she's performing, and a drum machine. As yet tho and probably thankfully so. No one label, or group, has taken it upon themselves to update and give thanks to the Cocteau Twins in a way that their immediate contemporaries; Slowdive have had done for them with Morr Music's ably positioned and most capable Blue Sky'd an Clear release. Mark Clifford of Seefeel, had a go at remixing the Cocteau Twins several times. While Mark Clifford was obviously indebted to the Cocteau Twins. His treatment of their material did leave a bit to be desired leaving many questions about how their material could and or should be treated as potential remixing material; especially considering that it has been sample fodder for numerous producers across the board. Rumors have spread on occasion about a new album of which work was underway at one time and the attempt for a reunion performance at the 2005 Coachella festival was cancelled citing differences of opinion just days before it was to happen. So it appears the Cocteau Twins are indeed through and kaput. Even as easy sell out cash in on the sentiment revivalists. But you never do know what will happen and stranger things have happened.